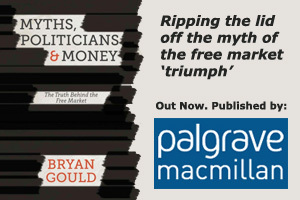 Bryan Gould’s new book “Rescuing the New Zealand Economy: What Went Wrong and What We Can Do to Fix It” will be published in New Zealand by Craig Potton Publishing. It will be in the bookshops on 22 September. Below is a short article about the subject-matter of the book. As the Reserve Bank struggles to deal with both recession and inflation, it is time to review the course of the New Zealand economy over the past 25 years and to seek reasons for the cumulative failures which have led us to such disappointing long-term outcomes. For too long, our policy-makers have argued that our poor performance – particularly in terms of productivity – is the result of everything other than their policies. Our comparative decline is now so endemic and so damaging to our living standards and even our continued viability, however, that we must draw the obvious conclusion that our policy-makers must take some of the blame. The truth is that the simple certainties of monetarism, which seemed such a sure-fire recipe for success in the mid-1980s, have long since given way to a more balanced view of the true role of macro-economic policy. We now know that there is a huge downside to locking economic policy into a straitjacket from which only a single unelected official armed with one single target and one single instrument knows the escape route. If we want a better economic performance, and in particular an improved productivity outcome, we must find a way of controlling inflation without burdening our producers with the highest interest rates in any advanced economy and with the perennial threat and reality of an overvalued exchange rate. The constant inhibition to competitiveness that results from an overvalued dollar means that New Zealand industry is never profitable enough to re-invest in new capability and innovation. There is no shortage of options for dealing with inflation that are both more effective as counter-inflationary measures and less damaging to the productive economy. It is only the ideology of the “free market” fanatics that prevents us from taking these sensible steps.